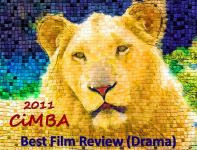 When I received an email from Rick Armstrong the other day telling me that I'd been awarded the Classic Movie Blog Association's 2011 "Best Review/Drama" CiMBA for my post on The Private Lives of Elizabeth and Essex, I was thrilled - and also surprised. The post had originally been my entry in CMBA's "Movies of 1939 Blogathon" last spring and I'd always thought of it as something of an outlier, being about a film that isn't generally counted among the truly great films of that much-vaunted movie year. 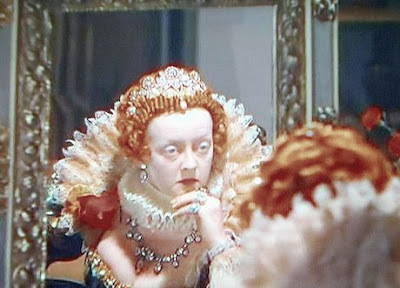 I took another look at the post and read it with, I'll admit, a certain amount of pride (deserved or misplaced...who knows), and what came through most for me as I re-read my own words was the depth of my admiration for Bette Davis. I remembered that The Private Lives of Elizabeth and Essex, though a moneymaker for Warners and a nominee for five Academy Awards, was bereft of statuettes and plaques. And I thought with some satisfaction (and cheek), "At last, Bette, this film that you were so eager to make, that you insisted was your 'tankard of tea,' has won an award!" Thanks to everyone who voted for my CiMBA entry - as well as those who simply liked it. I'm honored. Congrats on your award!! A very well-deserved one too, for a wonderful blog. Thank you also for being one of Backlots' most loyal readers, I really appreciate all your awesome comments. Congrats again! Congratulations, Lady Eve. I've said it before and I'll keep saying it - your blog is beautifully written and always a cut above. I love reading it. An excellent piece, and a well-deserved award. Congratulations. Congrats!! Eve, I'm so happy that you won your well deserved CMBA award. Your blog is one of the best classic movie blogs that I follow. Thanks FlickChick and Jacqueline and Dawn - you're three of the best and my favorite classics bloggers out there. Your words are so encouraging and mean more than you know to me. Can't say it enough, thank you! Eve, Congrats thats two wins in row, I'm very impressed keep up the excellent work, I love reading your blog. Hi Paul - I've been suggesting to some of the other 2011 winners that we ought to have a virtual party (and we should've had one in 2010 - you and I could've shared a toast). Thanks for your long-standing encouragement, Paul. I'm just one of your many fans giving you a standing ovation and kudos for your award win. I'll be right here with the rest of your loyal readers waiting for your next masterpiece. Oh, and I also adore Bette! Yes, Bette...it's very personally satisfying that my only full-blown Bette piece has won a CiMBA. Congratulations Lady Eve. I'll have to look at this post, it sounds great and with such rave reviews it must be! You're an excellent author/commentator. CW - I would swear I posted a response to your comment last night - but the important thing is that you know how happy I am you liked "Eliz. & Essex" - and thank you! And thanks to you, too, Birdie. Now that I know you have a blog of your own, you're on my blog-roll. I hope you'll apply to CMBA in Jan., when membership applications will be taken again. Congratulations Eve on both the well-deserved recognition for a best review of a dramatic film and on your one-year anniversary (Bette looks pleased, but I can't tell with the heavy makeup). Best wishes to you and your blog in the future; I look forward to what I am sure will be another year of excellent insights and writing.